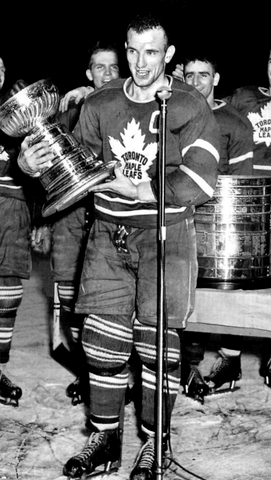 The 1949 Stanley Cup Final was a best-of-seven series between the Detroit Red Wings and the defending champion Toronto Maple Leafs, the second straight final series between Detroit and Toronto. The Maple Leafs won the series in four straight games to win their third consecutive Stanley Cup and eighth in the history of the franchise. he 1948 Stanley Cup Final was a best-of-seven series between the Detroit Red Wings and the defending champion Toronto Maple Leafs. The Maple Leafs won the series in four straight games to win their second consecutive Stanley Cup.